A Phuket’s beach hopping should be a vacation on your bucket list. A 4D3N Phuket getaway is surprisingly affordable and I’ll show you how you can make your dream island getaway a reality. 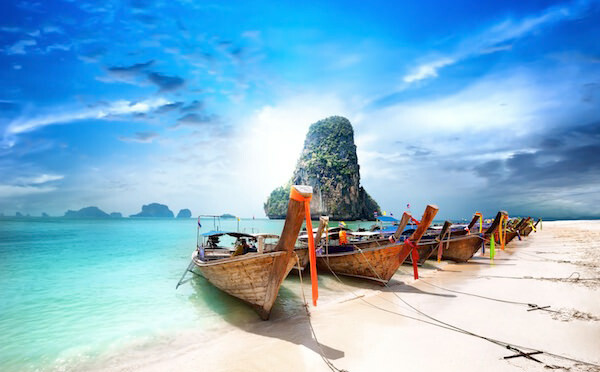 Phuket has got lots of gorgeous beaches to offer – Raya Island, Coral Island, Phi Phi, Maya Bay and James Bond Island. There are numerous fun thrilling activities like diving, fishing, sailing, snorkeling and canoeing you can do there for less than S$100 a day. You could also choose to go to a less touristy beach or craft your itinerary and explore Phuket in private transfers. Here’s the suggested 4D3N Phuket Beach Getaways Itinerary. Unlike some beaches in Thailand, Kata is clean with white powdery sand, less crowded than other beaches and the waters are warm and clear. Have some fun and rent a surfboard! It’s one of the best surfing beaches in Phuket (between May and November). After the beach adventures are over and money are well spent, head to the All-You-Can-Eat BBQ restaurant – The Tube Surf Bar and Restaurant. The BBQ menu includes pork ribs, fish, chicken, salad buffet, baked potato and French bread with garlic butter, all at an affordable price. On your second day of beach paradise hunting, you should head to Patong where you can have heart-pumping fun. The best way to pamper yourself is to get there on “limousine”. A limousine in Patong is usually just a large sedan. Enjoy a full day of excitement at Patong Beach as it is the best choice of beach for visitors who seek lots of activities like snorkeling, diving, sea walking, banana boat, or even parasailing. With jet ski operators, boat drivers, beach vendors and masseuses all vying for your attention. If you prefer to have a relaxing day, head to the Orientala Spa and opt for a 120-min Aromatic Thai massage. For dinner, go to the heart of Thai’s best seafood at the 99 Seafood Restaurant where its steamed grouper in Hong Kong style and fried lobster with garlic and pepper are the all-time favorites. Go to the Banana Disco nightclub to end the day with a bang! Experience Thai culture in Phuket Town. Take an extremely cheap bus to get here and see the beautiful scenery on your way to the town. There are many beautiful landmarks but the most recommended would be the Phuket Cultural Center. Learn the history and culture of Phuket, such as ways of life, homes, and utensils used in ancient times. Head over to Super Cheap Shopping Market, the biggest and cheapest mall in Phuket and it is so humongous that you practically can buy anything there. It’s located on Thepkasatree road and a perfect place to buy some souvenirs to take back home. Rent a motorbike to get to the amazing Karon Beach and Laem Sing Beach. Karon beach is situated between Patong and Kata Beach and it is a relatively busy beach. Laem Sing Beach, on the other hand, is known as a hidden-gem, popular among the local. Riding a motorbike is the cheapest and most exciting way to get around Karon. Visit Dinos Park Mini Golf, an extraordinary prehistoric-themed mini golf course. Afterward, head over to the Mantra Herbal steam Sauna and Spa for a relaxing sauna session. → Alternatively, you may want to rent a car or van with experienced driver and guide via Klook. Go to Angus O’Tool’s Irish Pub & Restaurant for a world-class meal that you will never forget. The menu selection has so much to choose from and each day has its daily special. If you are there on a Friday, you must sample the ribs that are probably the best ribs in Phuket. End the trip with a “bang” at Angus O’Tool’s Irish Pub where there is live music, entertainment, and sports. Phuket is the absolute best place to go to for a beach getaway vacation. It has constantly attracted over a million tourists every year and the secret lies in its beautiful beaches, affordable shopping and yummy food. Oh…, of course… the relaxing spa experience too.